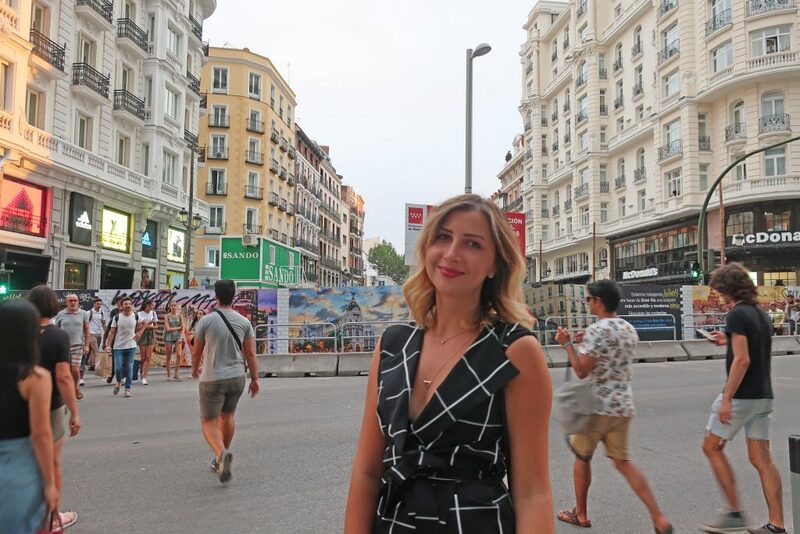 This map includes all of the best places to see in Madrid, Madrid’s top rooftop bars, a few of my favorite restaurants and more! Expand the Madrid map, download it and bring it on your trip. Don’t miss out on any Madrid sightseeing opportunities. The blue pins indicate attractions like museums, historic buildings, palaces, churches, gardens and parks. The green pins with a knife & fork icon show you where cool restaurants are. Click the individual pin to find out more information about each restaurant. Finally, the purple pins with cocktail glass icons show you where to find cool rooftop bars. But first…learn how to use this Google Map when traveling. This is Madrid’s busiest and most touristy neighborhood. This is where you’ll find Puerta del Sol, Calle Gran Via, shopping and nightlife. The Puerta del Sol, or “Gate of the Sun,” is one of the busiest public squares and one of the most popular attractions in Madrid. It is one of the most recognized sights associated with Spain. Just a 5-minute walk north from the Puerta del Sol, you can find great shopping along the Calle Gran Via. Near Gran Via, you’ll find popular European labels like Pull & Bear, Mango, Stradivarius, Zara and Primark. One Spanish chain that I loved was Sfera. They have locations all over Madrid, but you can also find a store in Sol’s shopping district. Another cool Spanish chain is El Corte Ingles. The El Corte Ingles are a chain of high-end department stores. There’s a particularly cool El Corte Ingles in Plaza de Callao, near the Gran Via, that has a rooftop terrace open to guests. It’s one of the greatest places to vist in Madrid for free panoramic views. The Sol neighborhood also offers access to few great foodie opportunities. In Sol, you must check out the famous Chocolatería San Ginés. 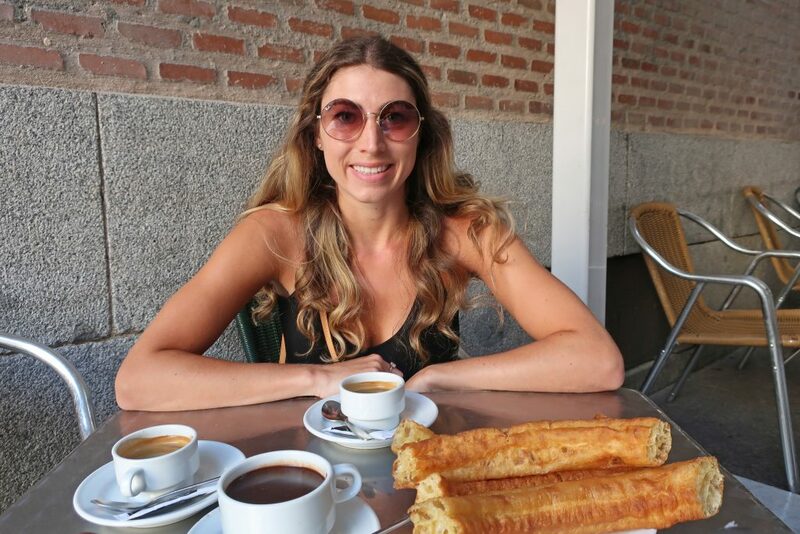 The Chocolatería San Ginés is SO famous because it’s been serving traditional churros with chocolate since 1894. Another cool & historic restaurant in Sol is Botín –which is the world’s oldest restaurant (According to Guinness Book of records). It was also mentioned in a Hemmingway novel. Botín is a great formal dining option after a long day of traveling. After sightseeing, shopping and dining in Sol…you’ve got to check out some amazing rooftop bars! My favorite is the rooftop at Círculo de Bellas Artes. 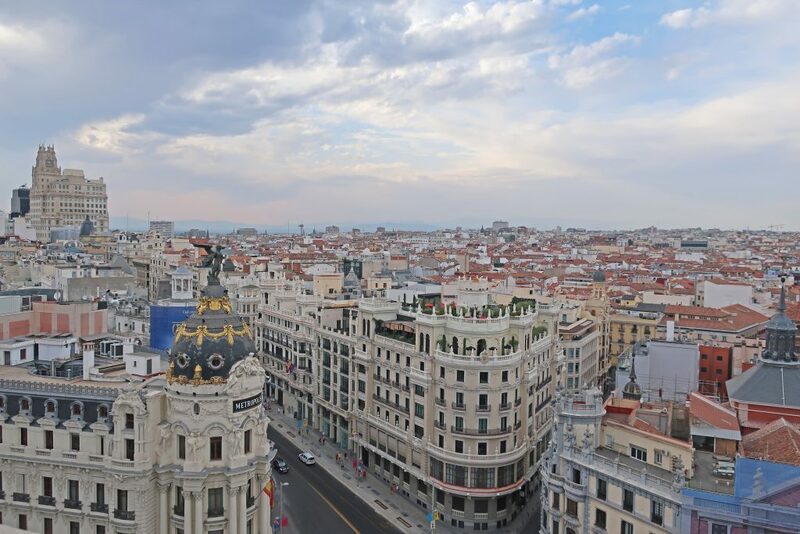 This is Madrid’s most famous rooftop, offering sweeping 360° views of cityscape. It costs about €4 to enter the rooptop terrace, but you can get a combined ticket for €5 that includes access to the exhibition halls. Círculo de Bellas Artes is primarily a cultural center that facilitates community engagement and displays artworks. Other rooftop bars in Sol include Doña Luz Restaurante and La Terraza de Óscar. The Austrias neighborhood is the oldest part of Madrid. It’s full of cool historic Madrid attractions such as churches, palaces and, even, a monetary. 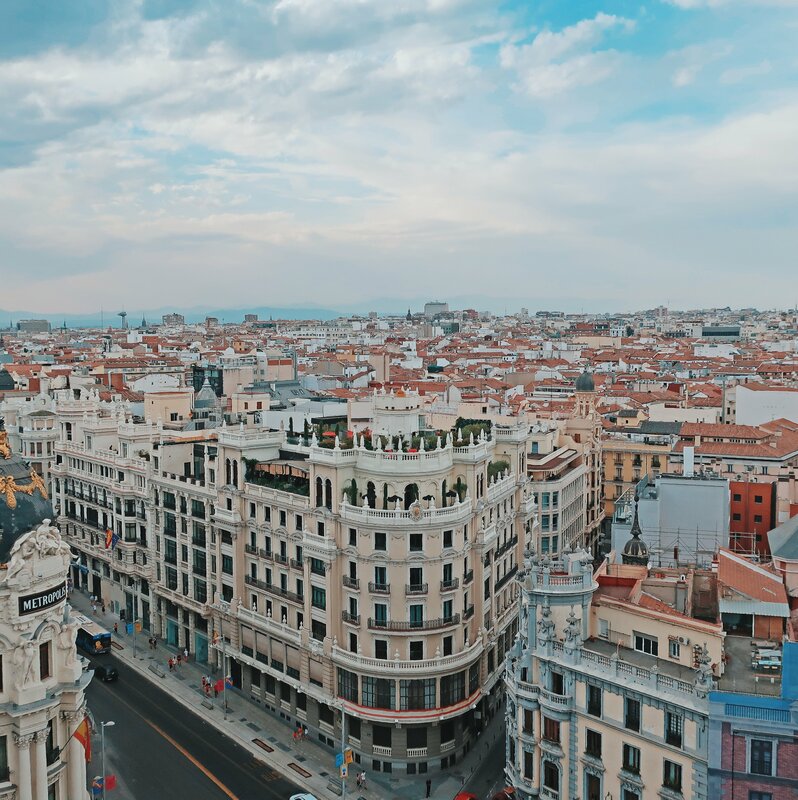 Our Madrid tourist map includes the La Almudena Cathedral, the Collegiate Church of San Isidro, the Basillica of San Miguel and the Basilica of San Francisco el Grande. These churches are all located about 10min walking distance from one another in the Austrias neighborhood. La Almudena Cathedral is one of the top things to see in Madrid. It is famous for its Neo-Gothic interior as well as it’s Cathedral Museum. From inside the Cathedral Museum, you will be able to visit the dome of La Almudena Cathedral. At a height of 70 meters, the Dome provides views of the Royal Place and the Basillica of San Francisco el Grande. The Museum shows important religious and historic works from the parish of Santa Maria de la Almudena. The La Almudena Cathedral sits on the same grounds as the Royal Palace of Madrid and the Sabatini Gardens. Make sure to take a stroll through the Sabatini Gardens. 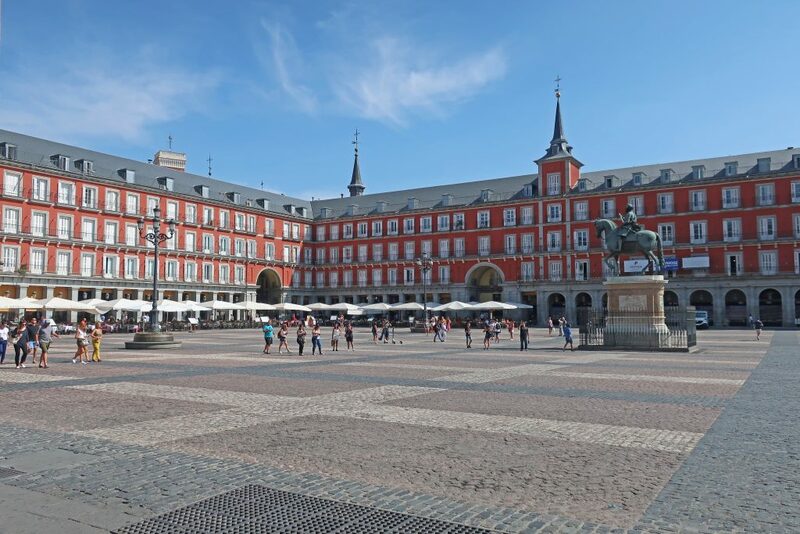 Finally, head to Austrias most popular spot –Plaza Mayor. Plaza Mayor is one of the most famous things to see in Madrid. Thousands of tourists visit here each year. It’s iconic due to its symmetry and uniformly rectangular architecture. At the center of the square is a bronze statue of King Philips III. The final important item on our Madrid Map, in the Austrias neighborhood, is the Casa de la Villa. This building previously served as Madrid’s city hall and prison. It is considered to be one of Madrid’s best preserved historic buildings. Paseo Del Arte translates to “Art Walk.” This Madrid neighborhood is known for its “Golden Triangle of Art,” made of three famous museums. These include the Prado Museum, the Thyssen-Bornemisza National Museum and the Reina Sofia Museum. 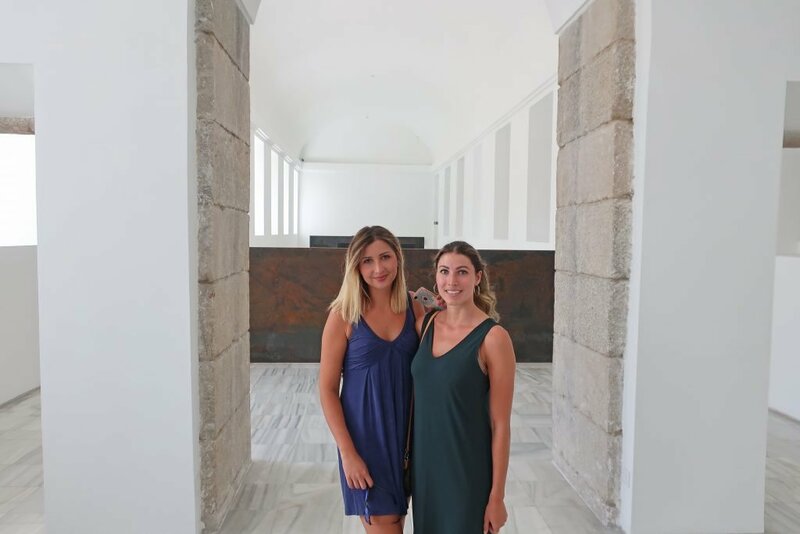 Pictured in the Reina Sofia below. The Prado Museum is the main art museum for Spanish national art. Although, it is considered to have some of the finest collections of European art in the world! The Reina Sofia features priceless works by Spanish Artists. It’s most famous for its impressive collections of Pablo Picasso and Salvador Dali works. Next, the Thyssen-Bornemisza National Museum shows an evolution in European paintings from Middle Ages to the twentieth century. El Retiro Park is not formally a neighborhood…but it might as well be! It’s as large as any of the other Madrid neighborhoods, after all. Some of the top things to do in Madrid can be found in El Retiro Park. 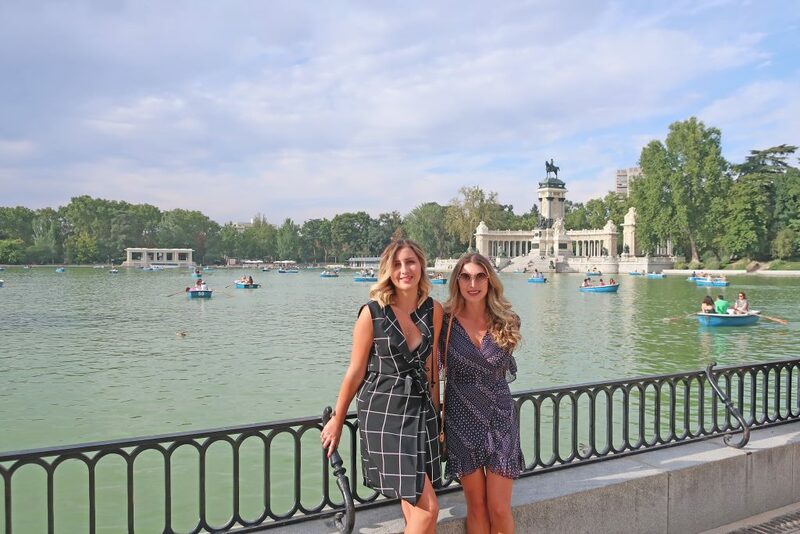 These Madrid activities include rowing boats in Retiro Pond, admiring the Crystal Palace, getting lost in the beautiful botanical gardens or riding bikes. This park is about a 30-minute walk from Madrid’s city center. 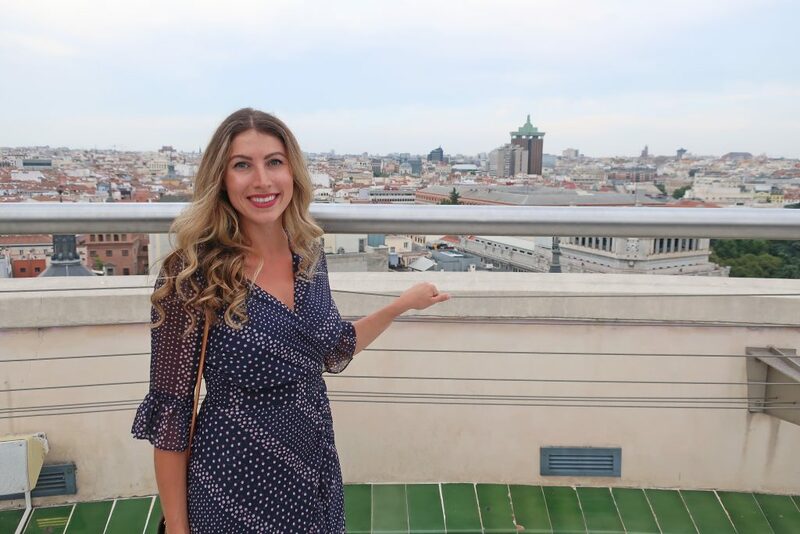 If I missed one of your favorite things to do in Madrid, comment below! I’d love to add more great content to this map. Is Valencia next on your Spain itinerary? Check out these beautiful places in Valencia.